Kol Ha Tor is an orthodox Jewish organization dedicated to establishing friendships, relationships to pilgrims of the Lost Tribes of Israel wishing to participate in a learning experience in Jewish Hebrew lifestyle and learn the foundations of how to live the life of Torah. You will be a special guest in a new Jewish guesthouse, learning to dine with Jewish kosher cuisine, have daily tours of the biblical heartland of Israel where the original Patriarchs Avraham (Abraham), Itzchak (Isaac), Yosef (Joseph), Yahshua (Joshua), plus Ephraim and Manasseh, the sons of Joseph plus all the 12 Tribes of Israel lived when they entered the Promised Land. Here was the awaited “Land of Milk and Honey” whose fruit and foliage was so bountiful that none of the wandering Israelites could believe the stories. The prophets have foretold that this land will once again flow with “milk and honey” and the Lost Tribes of the House of Israel will be restored. You will be traveling on escorted tours along the route of the first Israelites to enter the Land of Promise. Here are the hill-top settlements where the bravery, fortitude and tenacity of the Jewish settlers are creating in real life the future myths and stories of the Greater Israel. Nearby you will be traveling to Mount Gerizim, Samaria, where you can see the remnants of the ancient Samarians. Nearby you will visit Shiloh where the 1st Tabernacle was erected for 250 years before the famed Solomon Temple was finally constructed. And then into the Jordan, Jezreel Valley, you will be recreating the days of the ancient Children of Israel after leaving the land of Egypt when in an era of great catastrophes, they finally entered their new homeland promised to them by the G-d of Israel forever. A private Israeli tour guide will then take you to explore the Gilboa Mountain range in a 4x4 Wilderness Exploring drive. Here in the region of Northern Israel, with ridges reaching up to 1600 feet in elevation, it separates the Harod and Jezreal Valley. If the military conditions allow, a special visit may be a special event to get a rare visit to the ancient capital for the Northern Kingdom of the 10 Tribes of Israel at Sebastia. Nearby you will visit Joshua’s Altar still in its primitive state. Here at the Gilboa Mountains, many of the tales of the Prophets are told. After the Battle of Ai, it was here that Joshua built an altar on Mount Eival (near Gilboa) and there read the Torah to the Israelites (Joshua 8:30-38). 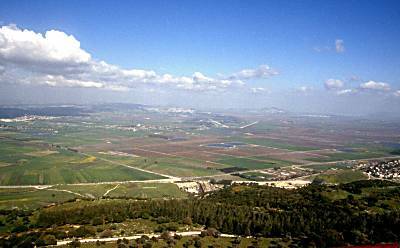 At the base of Gilboa, Gidean set up his impoverished commando camp near Ein Harod before his 300 valiant routed the thousands of Midianites from the land. (Judges 7:1-25). Later King Saul was slain in battle on these mountain ranges. The highlight of the entire tour will be to celebrate Pesach in Israel partaking in an authentic Passover Seder (Festive Meal). You will be privileged to celebrate with Rabbi Avraham Feld, Israel’s most celebrated rabbi dedicated to hastening the Return the House of Israel. Special day tours will be taken to Jerusalem with a walking tour of the ancient City of David, a visit to the celebrated Herzl Museum of Zionism, and the Holocaust Museum at Yad VaShem and a Saturday evening (Motzei Shabbat) walking along the promenades at the beachfront of Tel Aviv and ancient Jaffa. Throughout the entire festival touring season, there will be intensive discussions, spiritual rabbinic guidance, all wrapped around the Biblical visions of the prophets about to unfold in this sacred landscape. The Shabbat and Festival celebrations will all be held in the traditional Jewish customs and cultural style. The greatest will be the fellowshipping and sharing in the participation of preparing for one of the greatest unfulfilled streams of biblical prophecy; the Return of the Lost 10 Tribes of the House of Israel. The Beit Yosef Guest House (Pensione) is a 3-story, 10 bed-roomed house located in Shomron (Samaria) in the Karnei Shomron are surrounded by the relaxing rural surroundings of the mountains of Samaria. ·	The Fee does NOT include air tickets to Israel and returning home. ·	Terms: $1000.00 non refundable deposit with booking confirmation. Jaunting around the ancient city of Yaffo at night was like participating in International Drama. Resting in the Garden Tomb was like being in an oasis in a desert. Looking at the pictures and watching the videos at Yad Vashem was like a "Wake-Up Call." Seeing the Jewish Yeshivot secluded among the Old City Jerusalem shops was hopeful and refreshing. Traipsing through The Biblical Landscape Reserve in Israel with Ronit and reliving the ancient customs was enlightening. Visiting Sebastia was an unforgettable experience, especially climbing up those steep hillsides with the help of the strong men and some of the strong women in our group. Listening to the "pioneers" on the "homesteads" and seeing their resiliency, determination, and love for Torah and HaShem was heart-rending, educating and inspiring. Listening to Mickey was an education in itself. Clamoring up the hill to take part in the celebration at Sukkot's end was challenging. Also what a privilege to visit the cave where the young men who were staking out the land were staying! It was wonderful to dance with the "homesteaders" and their supporters. It was a privilege to be supporting them. Although I have visited the beautiful Shomron many times this was the first time I was impacted with the realization that this is "our (Ephraim's) land" and we need to come up and possess it as Jeremiah 30:3; 31:21-22; 32:44 and many other scriptures say. Whilst visiting Sebastia (King Omri's capital for the Northern Kingdom) I was struck with this is "our capital" and we all became quite indignant to find that the Palestinian Authority has a visitors plaque stating that the timeline starts at the Assyrian conquest in 721BC!!! i.e they are saying there has been no Jewish settlement in this area despite clear Biblical and archeological evidence to the contrary. To then visit numerous "settlements/outposts" by Judah and see how zealous they are for Hashem and His land, despite the many hardships they face, easily left one feeling "what can we do to help"? Ezekiel 36 and 37 and Jeremiah 30 and 31 seem to be very clear on "we are to join ourselves to the stick of Judah and take possession of the Land". Towards this end I have opened up an Israeli Bank Account and will be looking for Hashem's direction as to which "plot of land" He would have me buy. I personally can't think of a better spiritual and physical inheritance to leave my children and grandchildren. Another highlight of the tour for me was to stand on the heights of Mt Kabir with its 360 degree view looking into Jordan and out on Mt Gerzim (Mount of Blessings) and Mt Ebal (Mount of Curses) with the ancient town of Shechem in between. It was easy to ponder what a different world we would have today if only people were obedient to Torah but our sure hope and confidence is of course that one day "the law will go forth from Zion and the word of the Lord from Jerusalem", Micah 4:2.